Ernesto "Che" Guevara (14 Juin 1928 – 9 October 1967), for common kent as Che Guevara, or e'en juist Che, wis an Argentine Marxist revolutionar, politeecian, author, mediciner, an guerrilla. Ernesto Guevara wis born an growed up in Rosario, Argentinae. He dree'd the wheezles throu his bairnheid (he dreed thaim throu his hale life), but thay didna stap him bein a keen sportsman, his favourite sport bein Rugby union. He likit readin poetry an aw. In 1948 he listit at the Varsity o Buenos Aires for tae study medicine, but he teuk a year oot for tae traivel athort Laitin Americae on a motorbike wi his pal Alberto Granado mynt tae volunteer at a Leper colony in Peru. The diary he wrate on the vaige, The Motorcycle Diaries, becam a best-seller (an in 2004 a pictur). In 1955, he jynt the 26t o Julie Muivement, led bi Fidel Castro, ettlin tae owerthraw dictator Fulgencio Batista. He oreeginally mynt tae be the guerrilla's physeecian, but pruiven himsel tae be a braw guerilla fechter. He ris tae a heich poseetion in the guerrilla group, he ris tae the rang o Commandante, an becam ane o the heid-anes o the revolution. On Januar 8t, 1959, the guerrillas war victorious an Che becam pairt o the new govrenment. In 1965 he left Cuba tae traivel tae the Congo, tae jyne anither guerrilla struissle. Houaniver, durin this fecht, he wis gey unweel an wis dowie aboot his sodgers. He left that year, an traivelt athort the warld, steyin in sindry places. In 1967, he jynt guerrillas in Bolivia. Maugre o a guid stairt, the campaign gaed ill. The Unitit States sent elite sodgers tae fang an kill Che, the Bolivian Communist Pairty didna help Guevara an ither ill luck. Che wis fangit an kilt on October 9. His hindermaist wirds is weel-kent an wis "Shuit, couart, you are anely gaun tae kill a man!". E'en tho he anely haed ane successfu revolution, he is aye weel-kent e'en efter his daith. He is cried a hero bi fowk like Nelson Mandela, Jean-Paul Sartre an, o coorse, Fidel Castro. His diaries o aw his campaigns wis makkit intae beuks. 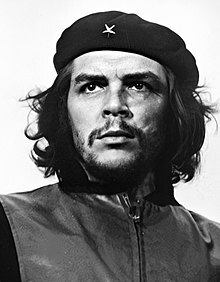 Wikimedia Commons haes media relatit tae Che Guevara.